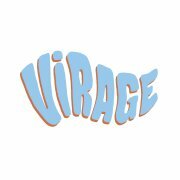 Virage Records is a freshly launched label startup from the French capital city Paris. Their first release is titled “Premier virage” and comes as various artists EP on vinyl and in digital formats and is built by the young domestic house music underground with an inherent smack of familiar ties. The suspicions supporting list of contributors show Bordeaux based Pierre Moritz from the crew of the likewise pretty freshly installed Copie Blanche label, the Parisian duo Alva, who are running Virage Records, the likewise Paris based Madcat and the production trio Paris Groove, which consists of a fusion of the musical efforts from Alva and Madcat. Ok, so now we know a little bit about the connections. It seems like we have a squad of French guys with a common passion for house music. And what about the sound? Regardless of the pretty fresh appearances of all of these guys on the stage of releasing music to the public world, the whole EP and each of the four titles on it come along pretty rounded and well-dosed. We can find warm and fat productions for the floor with a feeling and understanding for classical dance music roots. Shaped by the oldschool house of New York and New Jersey as well as 90’s UK garage and accompanied by a floating, balmy deepness and a gentle impression of soul, funk and disco these tunes seem like they were made to warm up feet and touch late-night dancers alike.